As Succar told me, the service is powered by Intuit’s own machine learning models, which it trained by feeding it anonymized data from its existing QuickBooks user base. “Inuit is uniquely positioned to innovate in this space because of the breadth and depth of data small businesses have entrusted us with,” explained Succar. 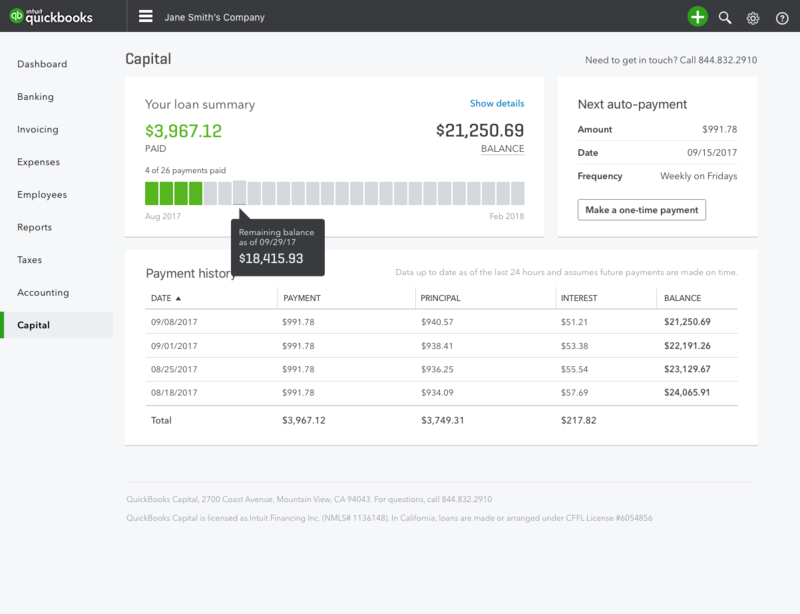 This allows Intuit to get a full picture of the current financial state of a small business and — more importantly — the ability to predict that company’s future cash flow and ability to pay back a loan. Why does this matter? Typically, lenders in the small business space have to make their decision based on a very small amount of data. So to keep their risks low, they often won’t lend to companies that are only a few months old, though these are exactly the kind of businesses that can often benefit from a small loan to jump on their next opportunity to expand, buy in bulk or bring on new customers. Intuit tells me that its credit model is based on 26 billion QuickBooks data points. With this plethora of data both about a specific business and comparable businesses in similar locations and life stages, Intuit’s machine learning models can create a risk profile and offer competitive rates — even for very young businesses that have only been around (or have used QuickBooks) for six months. Succar stressed that one data point that’s especially important here: understanding a company’s outstanding debt, which other lenders typically don’t tend to have a lot of data about but which Intuit Capital’s models can predict with a very high level of certainty. While the team obviously doesn’t have a lot of data about its loans yet (the company has only been beta testing this service with a select number of customers in the last few months), Succar is very confident that the default rate will be low and she stressed that it’s Intuit Captial’s credit model that allows the company to make loans to company’s that wouldn’t have otherwise qualified for one. “We are particularly proud to be innovating for young businesses because they are critical to the future success of the economy, but very under-served by the options available in today’s credit market,” said Succar. The lending process itself is done algorithmically. The service uses multiple data sources beyond QuickBooks data, including bureau data, and then provides a company that’s looking for a loan with an offer. That offer will include the APR and a detailed rundown of the monthly payments a company will have to make. The team argues that it’s rates will be competitive with those of other lenders. Succar stressed that the model is quite conservative and may not always give a business the size of loan it wants. The algorithm will make a counter-offer, though. Completing the overall loan process only takes a few minutes. Then, as a business pays back its loan, the model learns even more about this company and can then potentially make a better offer the next time around. 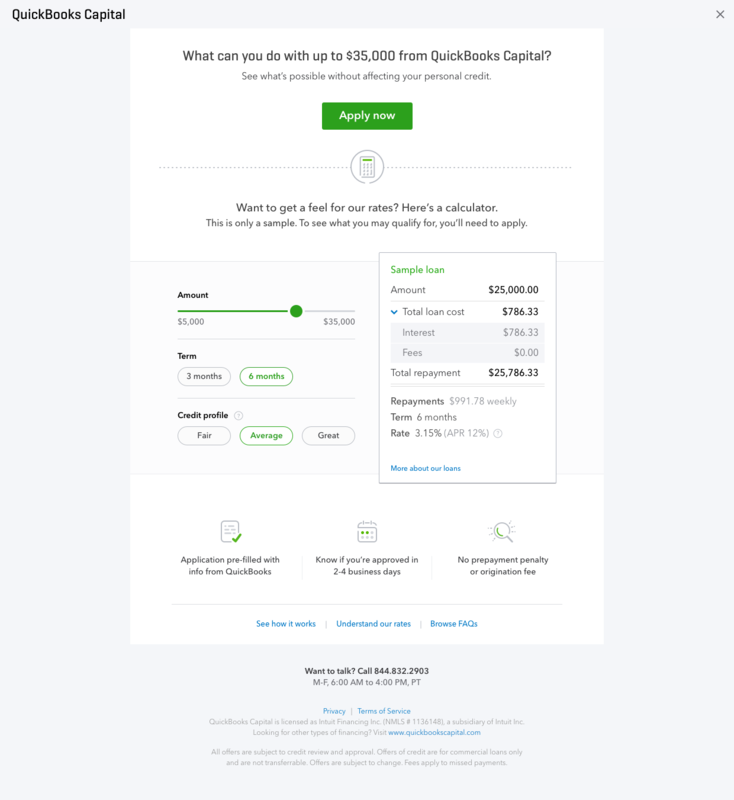 QuickBooks Capital is yet another example of how important access to lots of raw data is in this new world of machine learning. Intuit has clearly understood that it sits on a goldmine of small business data and that it can use this to expand its product portfolio with services that others simply can’t offer because they don’t have this kind of data to train their models. That’s been a recurring theme in my conversations with the company, so I wouldn’t be surprised if we saw more of these new services come out of Intuit in the future.